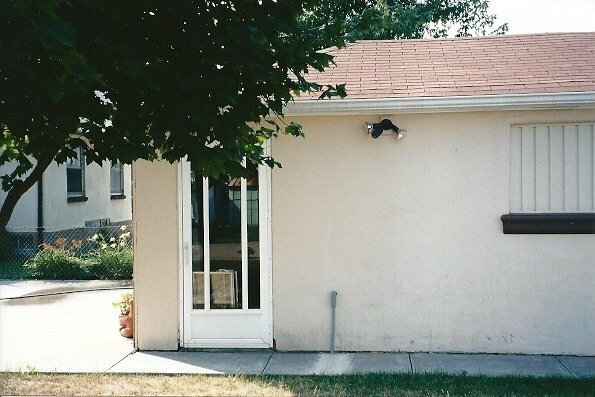 One of the first home improvement projects I tackled was replacing the storm door on the garage with a new pre-hung steel door. I had never hung a door before, but fortunately I had some help from my friend, Dave. I don’t know whether or not he had ever hung a door either, but together we were able to get the job done. Affiliate disclosure: This page contains links for products at Amazon.com. I earn a commission for purchases made after clicking through my links. The original storm door on the garage was not secure. 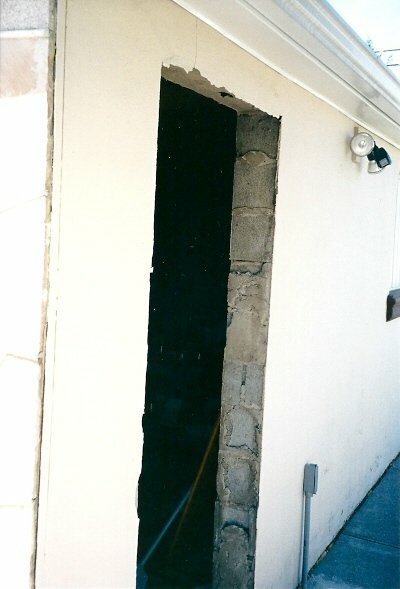 The garage was block and stucco construction with a wood frame around the doorway opening. I wanted as wide a door as possible, which led to removing the existing wood frame. The storm door was 82 inches high instead of the standard 80. 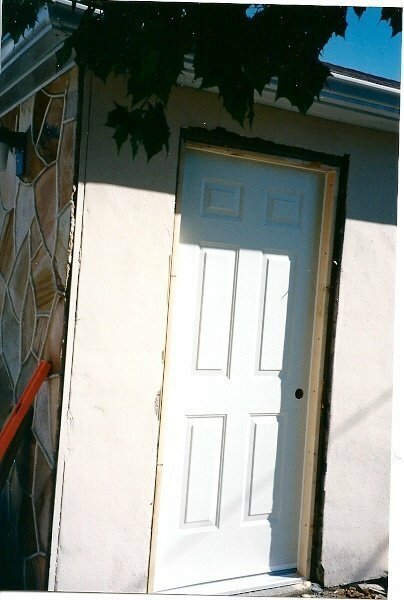 Because I did not want the hassle of ordering a custom size door, I had to deal with the extra space at the top. With Dave’s help, I removed the screen door and the existing wood frame. The frame was impaled on large nails that were actually embedded in the block (interesting). I used a reciprocating saw with a metal blade to cut the nails flush to the block. We then installed the new framing to which the door frame would be attached. We used pressure treated deck boards for the frame: one board for each side and three boards for the top (to fill the extra height). The top-most board was cut to the width of the doorway (less a quarter inch to allow for adjustment). The second and third boards were cut shorter by the thickness of the two side pieces to allow for a sort of rabbet. The top three boards were sandwiched together with screws and the side pieces were attached with screws driven through the top board. Wood framing removed from block. The block wall of the garage is 8 inches deep. Our door frame assembly was about 5 inches deep. We set the frame back from the edge of the outside of the garage by the depth of a 2 x 2 piece of lumber. Our frame assembly was attached to the block using concrete screws: 5 inch long screws for the top boards and 2″ long screws for the 1 inch thick boards at the sides. With the easy part out of the way, we were ready to install the new door. I found it to be an extremely frustrating undertaking. It is possible to hang a door without a helper, but most do-it-yourselfers will find that a little assistance is required. Word of advice: shake hands and apologize in advance for all the swearing that you are about to do. A little patience and a sense of humor go a long way. We positioned the door in the opening. 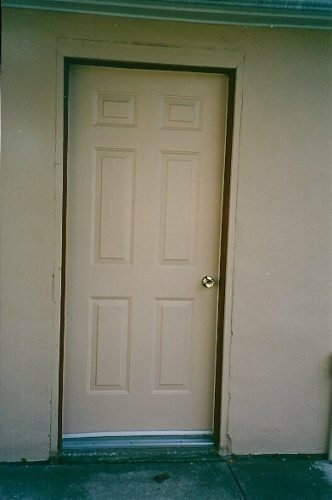 The rough opening has to be about 2″ wider and higher than the door to allow room for adjustment. In order to operate properly, the door frame has to be square and plumb. 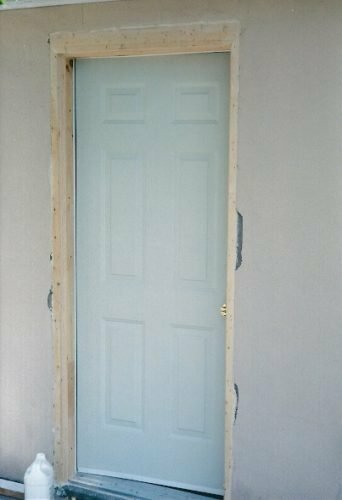 Square: The door frame has to be square to allow the door to close properly and securely, maintaining a good seal with the weather stripping. The door should swing smoothly and remain in the open position. Plumb: Front to back and side to side…. 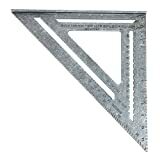 can be checked using a plumb bob, or use a level to measure vertically. We actually got very lucky as the hinge side of the rough opening was perfectly vertical. We were able to screw the door frame to that without using any shims. We shimmed around the rest of the door frame and screwed it to the rough frame. I then used expansion foam to fill the gaps. I have been told that the proper technique is to shim the corners so they are square. Then there is some debate whether it is better to shim and screw the hinge side or the latch side first. Frankly, I have since installed several other doors and I don’t think I installed any two the same way. The key is to continually check the swing and fit of the door and make any adjustments as you go. 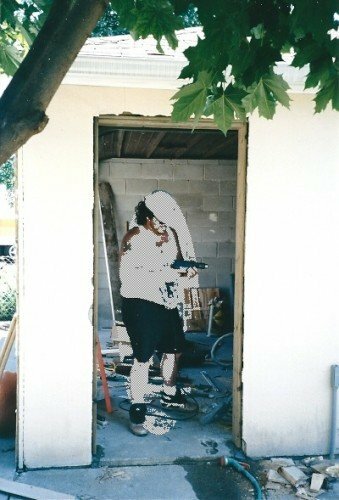 With the door in place, I used 2×2 and 2×4 lumber to bring the frame out flush to the exterior of the garage, and used quarter round moldings for the transition between the door frame and the new frame. Inside, I was a little less fussy and just used 1×1 nailing strips to come out flush to the interior of the garage. All gaps in the trim were filled with paint-able caulk to prevent water penetration. Another precaution that we took to prevent water damage was to leave a small space between the ground and the bottom of the rough frame. This gap was filled with expansion foam and caulk. The door and frame were painted to match the colors of the stucco and trim on the garage. The finished product, if I do say so myself, looks pretty good, though I wish I had used a semi-gloss finish (instead of satin) for the door. Any dents and dings in a metal door can be easily repaired using auto body filler. Sand the damaged area down to the bare metal. Apply the filler according to the instructions. Sand smooth, prime and paint. Project completed summer of 1998.